[UPDATED] Strategy firms are the most trusted names sought by CEOs and boards of directors who are reevaluating their companies’ identities, strategies and operations. Strategy firms have been making measured investments in social business over the last few years. Their knowledge of enterprise transformation is deep and broad, and they all have proprietary methodologies for most aspects of the strategy and transformation life cycle. They have deep and broad expertise in market analysis, competitive analysis corporate core competency analysis and virtually all aspects of operations. Many firms have large business transformation practices that explicitly guide clients through profound redefinition and change. Strategy firms have extensive core competencies that could enable them to offer social business strategy services. In addition, Strategy firms are significant producers of thought leadership relevant to corporate and business strategy as well as operations. Most firms field high quality management journals whose papers are written by their consultants. Many have research boutiques or even full-fledged businesses for research and thought leadership. However, they are challenged by very conservative cultures and have lagged adopting social technologies. Many firms are very private, which stems from the fact that much of their is conducted in utmost secrecy due to its strategic nature. Advisory and Services Firm Social Business Adoption 2012 is a research survey that evaluates and quantitatively ranks the maturity of agency and consultancy social business practices. The survey ranks Strategy firms, Big Four, Marketing/Advertising/PR agencies, Analysts, Enterprise I.T. firms and Pureplays on their social business practices, service offerings and leadership—specifically according to their relevance for leading client organizations’ transformations to more human entities that are grounded in listening and responding, not marketing. Given their core competencies in corporate strategy, business strategy, business transformation, and operational advice, Strategy firms rank highest in the early part of the Social Business Life Cycle, but their broad core competencies could enable them to address the entire cycle. However, their social business practices are nascent at best; in fact, most firms studied have contented themselves with producing social business-oriented thought leadership. Those that have “social”-oriented services have largely associated them with marketing, brand or customer practices. That said, several firms’ thought leadership explicitly addresses business transformation, which shows that they understand the life cycle. Feasibility assesses the adoption of social technologies by a client’s stakeholders, so it emphasizes the market as much as the client’s readiness to implement social business. Several Strategy firms had Feasibility-oriented services, but none showed that they understood the importance of engaging specific stakeholders to increase trust and business. This is within grasp of their competencies, and I deduce that several are defining their services now. Their firm category has a Medium-High capability. Strategy focuses on identifying the optimal social venues in which to engage, determining the client’s highest impact assets and designing pilots to execute the strategy; therefore, it requires more specific knowledge of social technologies and behaviors than Feasibility. Firms conduct granular analysis of social venues, stakeholders’ social actions and client assets and business processes. A valuable social business strategy requires strong knowledge of social business practice, and Strategy firms exhibit moderate to low levels of social business practice. They have a Medium capability. Pilot involves guiding clients’ execution of social business strategy, so Strategy firms have a Low capability because they exhibit uneven and moderate levels of social business practice. Their partners rarely “put themselves out there,” few leaders blog, and several firms’ comments were suppressed. Pilot is experimental by definition, so it requires less defined expertise to do well. Scale focuses on forging mature social business programs by expanding Pilot; however, its requirements for expertise are higher since the effort is more mature. This is well within Strategy firms’ core competencies, but due to their relatively low level of social business practice, they have more than None-Low capability. Integrate evaluates mature business processes in light of social business and integrates them or replaces the mature process with a social business process. The competency required is shared between social business and legacy, so Strategy firms’ core skills are more applicable. This is definitely within their core competencies, but their relatively low level of social business practice nets them a Low designation for now. The highest Overall scores for Strategy firms are bunched within single digits, but McKinsey edged out its rivals, largely on the strength of “The Social Economy,” a report published by the McKinsey Global Institute in July 2012. It is a significant contribution that rightly frames social business within a transformation context, and it is very widely referenced.I will hazard that it has the influence to hasten social business adoption of advisory firms in general. By making such a significant investment, McKinsey indicates that it is interested in developing social business services. Booz & Co’s Booz Digital is a boutique that launches “social businesses” by partnering with clients in various ways. The firm also presents a “Social Media Strategy” offering whose definition is thin on detail, but at least it exists, where most firms have nothing. Although Booz Digital does not seem to address client social business transformation, through it, Booz consultants are presumably developing relevant social business competencies, which raises the firm’s Overall score. Booz outscored any Strategy firm for Practice definition. BCG does not define a social business practice, but it includes social media within its “Digital Economy Competencies.” This includes some solid insights and case studies (“Impact Stories”) as well as competencies in digital strategy, customer insight, digital ecosystem, etc. Given this research survey’s use case, this might get the firm on the long list, but it is short on specificity, which seems to reflect a lack of commitment. AT Kearney topped its cohort in Point of view, Leader blog and Personability metrics, which moved the firm into the top zone. A small group of its senior partners blogs very well, and they show that they understand social business’s transformation potential. More than any other firm, AT Kearney showed an online demeanor that was is professional yet very personal and approachable. Bain is alone in the middle. It has no discernible social media practice, although some of its thought leadership speaks authoritatively on social media adoption. It also earned a top score in Sociality as its integration and use of platforms is relatively well done. The rest of the field has little to no mention of social business or social media services and relatively scant thought leadership. If one assumes that an increasing focus and volume of thought leadership is indicative of firms’ interest in and commitment to social business, these firms have decided to sit it out for now. ?The Capabilities section shows that some of the Strategy firms have a growing capability in social business strategy and execution, and they can potentially address the entire Social Business Life Cycle once they raise their competencies in social business execution. Here are my general recommendations for working with a Strategy firm on social business initiatives that emphasize organization transformation. Strategy firms have significant potential as social business advisors, and McKinsey and Booz & Co have made significant commitments to developing competency. Booz & Co has made the most overt declaration of its intention to offer social media strategy and launch social businesses. McKinsey’s Social Economy shows strong knowledge of the issues, but the firm has no defined practice or services in evidence. The main use cases for working with a Strategy firm are: 1) you have a very conservative culture and management’s approach to the unknown is commissioning detailed feasibility studies that emphasize market/opportunity sizing; 2) you have worked with social media firms and get the idea that you’re missing something, so you want a rigorous analysis to assess social business’s potential. Such an analysis is grounded closer to business strategy than marketing, so it is beyond the purview of most agencies. Unless the Strategy firm is able to field a team with demonstrated social business practice experience, I would look elsewhere outside of these use cases. BTW, look further back than one year when assessing team members’ Practice skills. One of Strategy firms’ biggest strengths is appreciating the context of social business, which most other advisory firm categories lack. This is due to their experience with enterprise transformation. In a way, the precipitating agent (social business in this case) activates the main activity (change). However, they will be compromised in their ability to advise organizations on social business transformation until they develop deep practice expertise. Social business uses digital tools for social transactions, but sociality and humanness are the differentiators; the technologies just provide mechanical tools to communicate and share being human. There is very little awareness of sociality anywhere, especially in consultancies. Sociality is something people “practice” largely unconsciously, so it represents implicit knowledge and skills. To leverage its power, organizations and individuals must make it explicit to speed their learning process. Sociality is difficult for professional services until they come to grips with this and change their orientation; as a 25 year veteran of professional services who hails from a medical family, I have had to go through that journey and appreciate how difficult it is. “Professional” connotes expertise, not “personality.” They do not have to be mutually exclusive, but most professionals will have to go through a period of synthesis to rebalance and learn how to be expert, conservative and human. Therefore, look for individuals, regardless of the logos on their business cards, because early adopters that practice and have explicit knowledge of humanness are your best leaders. Look at their blog posts: does a healthy portion deal with humanness, relationships, trust and sociality? Promotion is a small part of being human; don’t be seduced by clever wittiness. This is not to discount organizations, which can empower individuals or create obstacles for them. This research survey’s Practice score is much more valuable than its Leadership score because it’s a better determinant of the best advisors; it houses the lion’s share of differentiation. Keep in mind that one of the biggest risks of social business is companies thinking they are taking advantage of social technologies when they are not. Many of the social media early adopters who emblazon the covers of publications and conference podiums have succumbed to this pitfall. Social media is relatively empty calories when compared to building relationships. 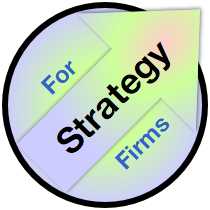 Strategy firms in particular are strong in business strategy and somewhat less in operations, unlike Analyst firms. I predict that they will grow their competencies quickly in 2013-2015. Many have undoubtedly been waylaid by the social media red herring, which purports that social technologies’ key business use is marketing and promotion. McKinsey’s Social Economy does not explicitly address the red herring, but it implies that less than one third, and possibly even less than one quarter of the “social economy” is comprised of marketing and communications. Do not pick a “type” of advisory firm; look for a balance of leading edge thought leadership, breakthrough thinking and walking the walk. With the exception of AT Kearney, Strategy firms do not show through their people on their main domains that they are comfortable using social technologies for their core business processes. I predict this will change significantly in the years ahead. 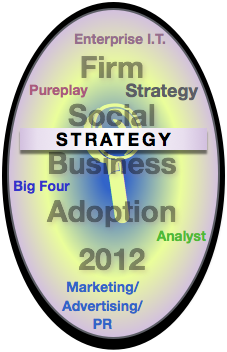 For now, if you are considering retaining a Strategy firm for social business, look for individuals who walk the walk. Do not allow yourself to be convinced that “younger consultants” are facile with social technologies. It is a widespread myth that “anyone under thirty” can “do social media.” Advising companies on using social business to transform their cultures, brand definition and operations requires the ability to interact with social technologies to increase trust and develop relationships. This is beyond individuals’ facility with using the technologies personally. Look for opportunities to partner with Strategy firms in social business transformation to help them build their practices through engagements with your company. Booz & Co explicitly suggests that they are open to non-traditional (i.e. not time and materials) arrangements at Booz Digital, and other firms may be, too. Most important, own your organization’s journey, don’t abdicate to any advisor. Strategy firms’ strongest capability is business strategy and transformation, so they can be valuable partners. As Score Distribution indicates, think to use Strategy firms during Feasibility and Strategy, where their capabilities resonate strongest with the Social Business Life Cycle. Strategy consultants are intelligent, knowledgeable and convincing. However, as a category of advisor, they tend to lean hard on quantitative analysis to identify and measure business problems and opportunities. Firm cultures are imbued with “proof through numbers,” and this may be out of place in helping companies maximize the benefits of social business, where the differentiator is largely emotional. Look for proof: can the members of the team the Strategy firm proposes show that they have experience developing trust in public? Organizations, in the outdated Industrial Economy view, are impersonal places, and the Knowledge Economy is changing that. All organizations need to go through a period of “humanization.” That means practicing, looking foolish, learning and adjusting in tight cycles. Practice is paramount. The longer your organization delays real risk-taking and practicing, the more risk it engenders. Most executives will be happy to get intellectually smart, grace a few podiums, get quoted in advisor case studies and call it a day. They are doing themselves and their organizations a disservice. Few organizations appreciate the necessity of practice. Look for individual strategy consultants who put themselves out there, usually via blogs, but also in Google+, Twitter, on YouTube and on social networks. SWOT analysis can be a useful tool to understand advisory and services firm strengths and weaknesses, especially to executives and professionals who have used it, so I have prepared Strategy firms’ SWOT analysis in the table. Experience and market permission for enterprise transformation work. Strong quantitative competencies, extensive proprietary methods and intellectual property developed through client work. The most comprehensive knowledge of enterprise transformation of any advisory firm group. Like the Big Four, Strategy firms have very conservative and private cultures, which can detract from their sociality. Their thought leadership vehicles are very formal. Little demonstrated knowledge of sociality, publicity and spontaneity. Traditional strategy firms can be limited in supporting execution and mentoring, which are crucial to succeeding in social business. Once Strategy firms develop core competency in relating online, they can become very strong players in all parts of the Social Business Life Cycle. Use quantitative skills to understand and use social data and reinvent business—strengthen the opportunity by aggressively building social business practice skills. Restricting themselves to impersonal elements of social business. Digital social will redefine business and society. Understanding its dynamics will be elusive because it humans don’t observe themselves well; if Strategy firms neglect social business, they will lose touch with the key driver of business. Strengths of Strategy firms are grounded in corporate strategy and transformation, so they can be very valuable partners in navigating social business-related disruption of organizations. Social technologies will severely disrupt many organizations, and Strategy firms have some of the best expertise available. In addition, they probably have more experience working with CEOs and boards of directors than any other firm category. Weaknesses are mostly social and a habit of avoiding the spotlight. Insist on seeing a firm prove its social business expertise by showing its team’s interactions online. All advisors learn during client work; just be sure you understand their level of expertise. Strategy firms that want to expand into social business can be congruent if they make this explicit. CSRA, for example, has a Beta Program for new offerings. We disclose to clients why we think we can add value, but we share that it’s a new area, and we charge them a special Beta Program rate. Opportunities will increase significantly for Strategy firms. Social technologies accelerate market volatility and change, as described in the Social Channel. Firms’ analytical capabilities are becoming more relevant, especially for Strategy firms that pivot toward sociality, which will usurp value from legacy determinants of competitive advantage. However, sociality is far more complex and nuanced. Like Analyst firms, Strategy firms can innovate by partnering with clients to develop metrics for sociality. The metrics used in this research survey can serve as an example. Strategy firms’ strong quantitative skills and methods could enable them to innovate extensively with social data. Threats are largely grounded in Strategy firms’ private natures. Most sociality is implicit, so Strategy firms will have to amp up their organic understanding of how to use digital tools to develop authentic relationships at scale. Only then will they maintain or increase their relevance in the Knowledge Economy, which is far more personal than the Industrial Economy. ?Social business will transform society and business because it changes the economics of relationships, what people do and how they do it. Moreover, people are leading the change, not organizations. Generally, disruption is beneficial to Strategy firms because it creates more change about which clients require guidance. That said, the kind of change that makes a difference is changing from mechanical to personal. Obviously these are general recommendations, and each firm is different. Getting your firm’s hands (and arms and shoulders) dirty with being spontaneous and human in transparent environments is vital. Developing explicit competencies in trust building and relationship management at scale will be a huge driver of competitiveness in business. This doesn’t mean CRM “relationship management”; it means hands-on interactions with stakeholders in public, where the network effect changes the economics of interaction. Firms that recognize this and develop competency ahead of the pack will benefit enormously because social technologies are accelerators. Strategy firms can use their own culture transformation to subsequently advise clients. Don’t approach this transformation superficially as some stakeholders will prefer. Most firms are “going through the motions” by using blogs as content management systems and not interacting. Very few partners interact with social technologies. Senior partners have to be involved to make it real. Approach firm culture change head on. The way in which firms, and members within them, approach being human and public allows for significant variety, but it will require profound culture change at many firms. The earlier you start, the better. It is difficult to overstate the profound change that is upon individuals and organizations. We primates are profoundly social; sociality is arguably our defining trait. Making sociality digital will change most human structures, organizations, patterns and habits. To remain relevant, Strategy firms need to be in the middle of it—as practitioners. Therefore, building social business capability in all parts of the life cycle is at least as vital from an R&D perspective as it is from a profit viewpoint. Social business capability will enable Strategy firms to derisk how their existing businesses weather the storm. Clients’ needs will change profoundly, and seeing their evolution from the inside will be a significant advantage. Careful management can maintain existing profit margins for years to come, especially when Strategy firms focus on how social business is affecting legacy practices. As this research survey’s executive summaries will reveal, Strategy firms don’t have the mental baggage of the Big Four firms, whose audit and tax practices are regulated. Strategy firms have more mental mobility. Anticipate and empower culture change. Strategy consultants epitomize “knowledge workers” and increasingly have individual reputations that may dwarf organizations in fast-developing areas like social business. You will be better able to engage stars if your firm redefines itself as a platform for individual consultants to develop their careers. Optimize your roles to empower individuals. This requires jettisoning paternalistic attitudes that pervade Strategy firms, Big Four, MAP agencies and Analyst firms. Not starting the firm culture change early enough. The Knowledge Economy is a more personal and public economy, and Strategy firms tend to be formal and private. Obviously there is a spectrum, and firms will always have distinct cultures. Overall, though, firms will have to loosen up. The market is full of talk about “social,” but I observe that few people or firms really understand how it works; addressing emotions, trust and relationship is far more complex than most people recognize, which will delay adoption. This serves as a barrier to entry to the advantage of firms that get it right first, but expect the learning curve to be longer than you anticipate. Practicing social media and thinking that is “keeping you current.” The market overall validates social media because it hasn’t discovered social business yet. Sociality, relating to people, is far more complex and nuanced than promoting things to people. Make sure your firm appreciates the difference.